In this update of a 1961 film, twins Annie and Hallie (Lindsay Lohan) are strangers until happenstance unites them. 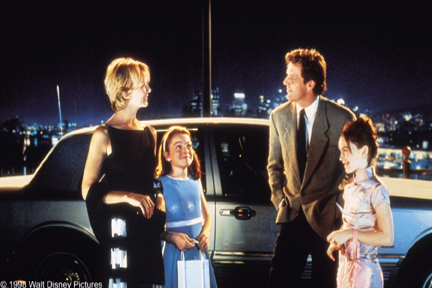 The preteen girls divorced parents, Nick (Dennis Quaid) and Elizabeth (Natasha Richardson), are living on opposite sides of the Atlantic, each with one child. After meeting at camp, American Hallie and British-raised Annie engineer an identity swap, giving both the chance to spend time with the parent theyve missed. If the scheme works, it might just make the family whole again.